How am I supposed to do both? Okay I guess you could use stepping stones to get around but a lot of the chemicals used to keep grass looking golf course green year round aren't very environmentally friendly. Which is why it comes as something of a shock to find out the National Wildlife Federation has partnered with Scott/Monsanto. For whatever reason most of the Wildlife Gardening community seems to be outraged. Normally these two signs above would be featured on two different lawns. Typically both are used to explain the madness in landscaping aesthetic. 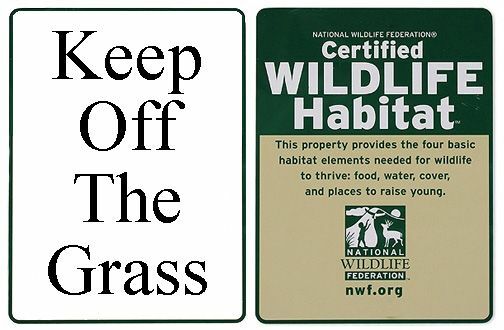 The Wildlife Habitat sign is ideal for explaining why there's a tall-grass meadow in the front yard, and the Keep Off Grass sign is ideal for explaining why the home owner's water bill is so high. Now we can have both! To be honest though, I think some of the best landscapes are when these two elements work best together. Lawns look nice, they typically hold up to foot traffic, we're getting Eco friendly no mow varieties now, and the green tends to look better than bare ground. Prairies and small Meadow plantings are ideal garden plants whether they're in a wild densely planted patch, or each plant is spread out to have its own individual space around it. The "sins" of applying chemicals, mowing, and over watering lawns are on the home owner, not the Scott/Monsanto. To talk about the National Wildlife Federation now, I've never been a huge fan of them. Just looking through their website and catalogs clearly their ideal customer is a female over the age of 35, who likes to wear nature sweaters, collects plush toys, and probably shops at the Hallmark once a month. They could really stand to widen their audience a little with the products they sell. Does anyone honestly want to Adopt a Moose or buy a Horseshoe Crab Plush Toy? There was even a TV show at one point where they'd landscape a home to make it a Certified Wildlife Habitat. My memory of the show was them doing the bare minimum to satisfy their criteria. I get they were trying to show how easy it is, but at the same time I got the feeling they were just trying to sell signs. Planting butterfly weed, including a bird's bath, and making a pile of stones is hardly saving anything. In the episode they devoted around 5 minutes about the 1 butterfly weed plant they put in the garden and kept emphasizing "ALL THOSE BUTTERFLIES THAT ARE GOING TO GO NUTS FOR THIS!" which comes off being really stupid, and even more so that I can't recall there being any butterflies in the episode. Do these people know what they're doing at all? Imagen if the show was all like "Move That Bus!" and there was just one milkweed plant there. I feel like there was more effort put into hanging the Certified Wildlife Habitat sign than actually building the habitat itself. Canceling this show was the right thing to do becuase it sure wasn't doing them any favors. With the exception of showing the wrong species at 1:19, (Apis dorsata), this is the most intelligent and informative video on CCD out there. So there's a computer game that simulates farming called Farming Simulator 2011. Which looks like a worthy successor to Sim Farm in that you run a farm. From the game play that I've seen though it doesn't look like you get pick what you grow, and driving around is all you do. You can't even own a shot gun to point at unwanted solicitors and be like, "Get off my lawn." I would love for there to be an updated version of this game. 3D or not though it would be great if they incorporate modern ideas such as dealing with invasive species, plant diseases, using Genetically Modified Crops, pollination, and even prairie restoration. The point wouldn't be to say one is better or worse but rather let the player get informed and take a side. Maybe even play it out to it's ultimate goal, even if it is a deluded fantasy. Highly favoring GM crops might lead society to a world where everything is naturally trimmed to perfection. Lawns naturally stop growing after they reach 4 inches tall, trees look proper to an ascetic and naturally grow into topiary shapes, Oh and corn cures cancer now. Highly favoring conservation might lead to a society where permaculture farms are in everyone's back yards, or "environmental corridors" as our city architects now design housing developments around. The seed bank is over flowing with heirloom varieties. And the people are richer in a different way. And of course there's all the fun stuff in between. Getting Hemp legalized and having it used as clothing, and printing money or whatever. Importing exotic species or unlocking native ones that are currently not on the market. It's come to my attention that Doug Tallamy has done another talk and it's here on youtube. I recommending turning the volume up a little though as I found him to be very quiet in the talk. This man is a master of talking about biodiversity. Other than the volume issue this is a well edited talk. I wish he'd write something else because "Bringing Nature Home" is his only real book, that he's been the sole author. The most recent "The New American Landscape" is something he co-authored with maybe a dozen or so others. I intend to read it at some point. Yet another possible theory to CCD, one that NEEDS TESTING has come up as a possible cause of CCD. A parasitic fly, Apocephalus borealis, which typically uses bumblebees as hosts has been found to also use Honeybees as well. Their life cycles seem to overlap with that of CCD epidemics. Basically the fly injects eggs into the abdomen of the host and a few days later, I read, about 13 new flies burst out of the bee. While infected the host bee will continue flying at night in a daze, thus they don't return to the hive hive. So there's lots of correlation here. The next step will be to find out how far spread these flies are and whether their populations are great enough to decimate whole fields of hives within their life cycle for the effected areas.